Inverurie Station, Station Road, 1902. A three-platform through station of the Great North of Scotland Railway replacing the small, cramped station of 1852, which lay half a mile to the south, and emphasising Inverurie's key position at the heart of the new communications system in central Aberdeenshire. On down-platform is a long single-storey office building in coursed rubble with cupola and wind vane which doubles as a ventilator. 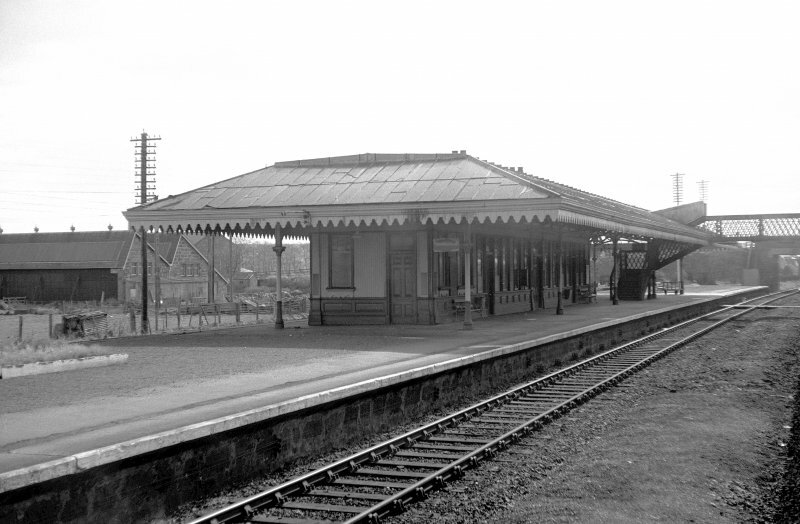 Good cast-iron piers for awning; was also junction for Oldmeldrum railway. Station refurbished 1989. For (predecessor) Inverury Station or Inverurie, Old Station (NJ c. 7783 2110), see NJ72SE 153. (Location cited as NJ 776 218). Rebuilt 1902 by the Great North of Scotland Rly. A three-platform through station, formerly the junction for Oldmeldrum. The main offices are on the down platform in a long single-storey, coursed-rubble building. The most interesting feature of this is an attractive cupola with windvane, which functions as a ventilator. The island-platform building is a large single-storey wooden structure with an all-round glazed awning supported on cast-iron piers. The goods shed is a sizeable wooden structure. This intermediate station on the Inverness-Aberdeen (main) line of the former Great North of Scotland Rly. was opened on 10 Feby. 1902 in succession to the former station (NJ72SE 153) at NJ c. 7783 2110. It ceased to be the junction station for the Old Meldrum branch with the closure of the branch on 2 November 1931 but remains in regular use by passenger traffic. Photographs of buildings in Inverurie, Aberdeenshire, by the National Buildings Record Scottish Council in March 1954.